Why not take advantage of booking a VIP Booth or table for the night to ensure you have the ultimate party experience. 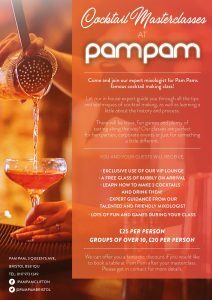 Once your table is confirmed you can relax in the knowledge that Pam Pam will endeavor to make your night one to be remembered. To reserve a table we require a deposit, and a minimum spend does apply. The minimum spend can only be spent on bottles of spirits, champagne, prosecco or wine. Diamond VIP – £360 minimum spend, use of our exclusive VIP lounge and bar. Platinum – £280 minimum spend, includes table service. Gold – £240 minimum spend. Fast tracked to the front of the queue. A promise to keep your table clean and tidy throughout the night. All prices are based on tables of 8. Additional guests will incur extra charges based on numbers. If you would like to pre order your alcohol please contact us to discuss. Please be aware that tables without a deposit will run the risk of losing the reservation if the party doesn’t arrive before 11.30pm. We do not offer a public guest-list so we recommend all customers to arrive at 10pm to avoid queues. Navigate the club below and choose your area. Each area can be hired independently or as a bundle. Each area has a 360 degree image for you to view and enjoy.